You may not realize it right away, but if you’re in the market for a bike, you’re likely also in the market for a bike headlight. Several bikes come with headlights, but the majority do not, and to keep yourself safe, that means you’ll soon be shopping for more than you may have expected. Even if you knew what you were getting into when you bought a bike, there may still be things you didn’t know you should consider before making your purchase. Typically, bike headlights are relatively inexpensive, but that doesn’t mean you need to risk buying something that will break or you won’t like. We reviewed dozens of bike headlights to identify the best of the best. We looked at the brightness, the bulbs, batteries and so much more to determine who has the absolute best and what was still nice about all the rest. Check out the Sosper’s Bike Light and say hello to quality! During our search, we identified the Sospers Mountain Bike Headlights relatively early on as a clear winner of our “Top Pick.” It’s an easy recharge with its USB cables, and with its five different light modes, this bike headlight is sure to suit your needs. Who Should Buy a Bike Headlight? The Sospers Rechargeable Mountain Bike Headlights do more than just light your way. Not only will you get a headlight and taillight, both, but each light also has a variety of modes for a variety of causes. You can switch between 5 headlight modes: light sensing, strong brightness, weak brightness, SOS flashing, and fast flash. The taillights offer 6 modes: standard brightness, high beam, overdrive, 50% flash, 100% flash, and strobe. At its highest, the LED bulbs offer 320 lumens and 360 degrees of visibility for your biking excursions. The installation is a breeze with no tools required; it’s just a matter of snapping it securely around the handle of your bike for the headlight and just under the seat for the taillight. The headlight also separates from the mounting straps quickly so you can use it as a flashlight on-the-go. While it only has 61 customer reviews on Amazon, it’s important to note that all 61 reviewers gave it the same perfect 5.0 rating, which certainly makes it worth a look. We think if you’re in the market, this light set will definitely fit the bill. 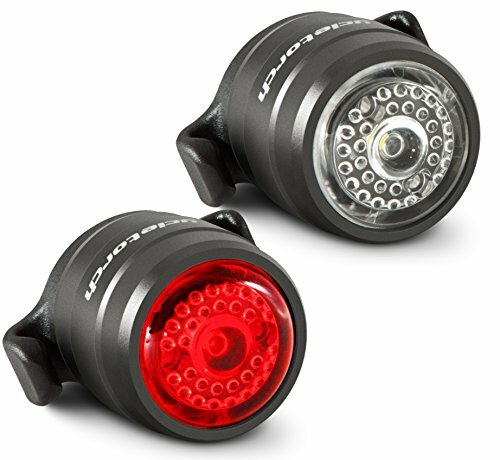 The Cycle Torch Bolt Combo is a perfect safety light for the front and back of your bike! The Cycle Torch Bolt Combo – USB Rechargeable Bike Light Front and Back is universally compatible which means you can mount it on any type of bike: commuter, mountain bike, BMX or even a tandem bike. Its LED lights are featured in a compact headlight and encased in a red taillight so that this set will provide visibility for oncoming traffic and those approaching you from behind. The lights each have 4 modes to flash or solid in different patterns, which will prove useful for a variety of uses. The battery in each light is rechargeable via its USB cable which is also included. The lights are water, snow, and mud proof so you’ll feel comfortable taking them with you wherever you ride. They’re easily installed and removed so you can switch if you need or remove for charging, should you choose to do so. The headlight is a subtle 20-lumen and the taillight an even more muted 10-lumen, so you won’t need to worry about it being intrusive to your surroundings. If the 4.7 rating from over 600 reviewers on Amazon doesn’t convince you, then don’t forget that the manufacturer ensures your happiness with a money back guarantee and 1-year replacement warranty. And considering it’s just $20 for a set that you’ll have for many years to come, that seems like a pretty good product to us! The Malker Bicycle Light Pack will provide plenty of light for maximum visibility! Each of these waterproof lights are presented as one sleek piece so you won’t struggle with installation; they simply wrap around the bar (whichever you choose) and mount with ease. The housing is silicone and easily removed for battery replacement, but the first set of lithium-ion batteries is included with your purchase. The Amazon rating is a very respectable 4.2 with over 1,200 reviews, making it a solid buy. The real clincher for this bike set, though, is that for four lights, you only have to shell out $9! The Apace Vision Bike Light Set comes is all you’ll need to keep your bike ride well-lit! 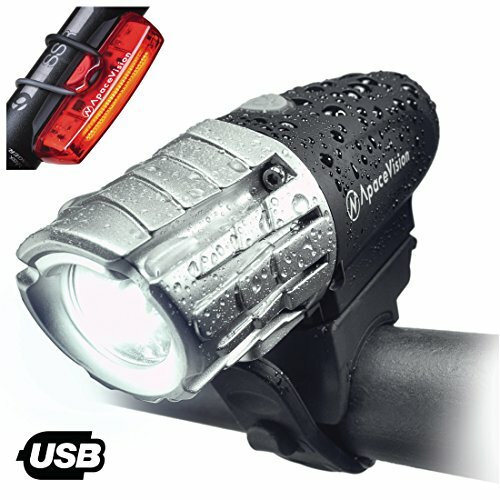 The Apace Vision USB Rechargeable Bike Light Set can slice through the rain and fog with its angled 120-degree beam and 320 lumens. With this purchase, you’ll get both a headlight and taillight and all the installation gear you’ll need. But don’t be surprised that it isn’t much; the installation is a snap. It’s easy to remove and recharge these lights, too, with the (included) two USB cables. The quick release of this headlight will allow your bike light to pull double duty acting as a flashlight, too, should the need arise. Depending on the light setting you choose, the battery will last anywhere from five to fourteen hours between charges and the time it takes from 0 charge to 100% is only 2.5 hours. You can also choose from a black or blue case, so you can pick which will better match your bike. You can get this set for under $20 and with a rating on Amazon of 4.6, you can purchase with reasonable certainty that you’ll be satisfied with the product. The Blitz Gator 390 USB Rechargeable LED Bike Light Set is a perfect example of an efficient LED light in practice. It is water resistant in a plastic casing so you won’t need to worry about the rain, but with its USB port, you wouldn’t want to take it swimming. The light mount disengage with one touch and slides out for use as a flashlight in emergency situations. The headlight has 4 different modes that will allow you to really utilize the 390 lumens and with its included taillight, you will have 360 degrees of visibility. With its daytime visibility, your bike will be visible in the brightest of sun, darkest night or the rainiest of days. On the brightest light mode, the battery will last a full 2 hours, and from a 0 to full charge, it only takes 2 hours. With an Amazon rating of 4.6 with over 1,400 reviews, this is a well-loved product that satisfies plenty of needs. And if that’s not enough to convince you to give it a try, the manufacturer offers a 100% satisfaction guarantee for 30 days and a 1-year warranty. To summarize who should buy a bike headlight, the answer is pretty simply: everyone who owns a bike. But to put a finer point on it, you’ll really need a bike headlight if you plan on riding your bike after dusk, before dawn or in inclement weather. However, even if you don’t plan on using your bike under these conditions, you’ll want to consider the unforeseen events in your life. Because you can’t always predict the weather or the length your trip can take, you’ll want to be prepared by having a headlight, just in case. It’s not only for the sake of your own visibility that you need a headlight, either. A light on your bike can go a long way in letting cars see you and drive accordingly. Not to mention if you are traveling at dusk, animals may not see you without a light, either. The risk to you (and others) goes down substantially if you properly utilize a bike headlight. Rechargeable. If you plan to have your headlight on frequently, you’ll need to consider that no battery lasts forever. You’ll need to weigh the costs and convenience to find your preference, but most people opt for a rechargeable battery rather than replacing. (Although keep in mind if you don’t plan on using it often you may not ever need to replace the battery.) There are different ways to handle recharging; you can buy rechargeable batteries, or you can buy a light that comes with its own charger for its battery. With the latter, you will find there are several that use USB charging plugs so you will need to plan for accommodating that if you pick out a light with such a plug. Keep in mind adapters aren’t difficult to come by, so you can probably plug it right into the wall. Portability. This is especially important if your light uses a USB charger. You may be able to set up an adapter that will allow you to plug it into the wall in your garage, but you will most likely want to have the ability to easily remove the light or the battery for a convenient charge. This may mean the installation is less permanent or it could mean that the battery is easily separated and transported inside. Lumens. A lumen is the amount of measurable light emitted from a source. Essentially, it refers to how far the light will shine to allow visibility. The number of lumens you’ll need for your bike light will depend on what your bike will be used. You’ll need a brighter light for nature rides, and a less intense light for your evening urban commute. You’ll want to find a lumen count that is preferable for your intended use but keep in mind that there are bike lights that have a variety of settings, providing several lumen settings. Secure attachment. You’ll want to make sure the attachment feature on your bike light is a reliable one, especially if you plan on using your bike often. Read the reviews and make sure you’re getting a headlight that will fit your specific bike, although you will find a fair amount are universal fits. If you purchase your light and feel you may need some extra stability, don’t be afraid to modify it a bit to add some durability to the attachment. Sets. A lot of bike headlights come with a taillight, too. And while you may want to purchase your own special tail light or just skip it entirely, you’ll want to weigh the bonus of some sets in your decision-making process. After all, if you plan on buying a taillight for the extra safety, you may as well save a few bucks and pick up a set! Extras. Check the “What’s Included” section of the headlight you’re purchasing to see what, if any, extras you’re getting. It will likely come with mounting hardware, but you’ll want to be sure. Likewise, straps, carrying cases and charging cables or batteries included will all help sway you from one light to another. What’s a bike headlight and how does it work? A bike headlight is a light that you secure to your bike that will make you visible to oncoming traffic and will light your way in the dark. Most bikes do not come with a pre-installed headlight, but you will definitely benefit from them, so you’ll likely need to purchase one separately. The headlight will look slightly different but function, essentially, like a flashlight that you secure to your bike. You will turn it off and on and switch the modes from the light itself. Do I need lights on my bike at night? Legally? The short answer is probably yes. You can look at the legal requirements of each state posted by the League of American Bicyclist. Each state has pretty specific requirements, but most require reflectors and a light on the front of your bike if you’re out after dark. (And there are no allowances for poor planning or accidentally out past dark.) Remember though, even if your state doesn’t require a light, you do still need one for the sake of your own safety. If you aren’t seen, other traffic can’t make accommodations for you. How many lumens is good for a bike? You’ll need different lumens for different purposes. Obviously, if you plan on riding through a dark mountaintop, you’ll need a brighter output. For regular use in extremely dark environments, you’ll want a more powerful light, nearing 1000 lumens or even more. If you want to immerse yourself in the scenery, you may want to go a little lower, but for your own safety, you’ll want to stick close to 1000 as a minimum. For a more urban ride, around the city or a well-lit area, then a lower lumen number will be better. You can probably stick around a 200-lumen light. You don’t want the light to be intrusive in homes or glaring to other traffic, but you still want to make sure they see you, and you can see all you need to, as well. If you’re planning on a combination of urban and rural riding, then you can find a good light that has several modes for your best bet. Where do I attach a bike headlight? A lot of headlights will come with specific installation instructions, and you should always check that, first. Not only is that most likely to be a secure and durable installation, but there are also lights designed for different locations you may not consider. Several go on the handlebars, some on the front, others on the top of seat tube. Typically, you would mount the headlights on the head tube or the steerer/top of the fork. In case you’re not familiar with the names of bike parts, that’s the front vertical bar. However, there a lot of accessories that you can install onto your bike that may make this location unfeasible. If you have a basket, for example, you will likely need to make other arrangements for your headlight. You may find it best to install it above the basket with an extension mount, but the simplest solution would be if you could secure it to the front of the basket. This 320-lumen light will give all the visibility you need, and the taillight will combine for 360-degrees of visibility. This bar-style light will give you a range of 1000 feet of visibility and has up to 12 hours of battery life before needing to be recharged. With this set, you’ll have a thrifty solution for visibility in the front and back of your bike and reviewers claim they work just as well for daylight, too. 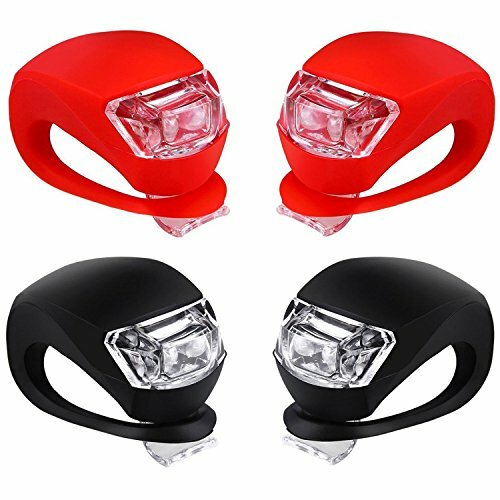 This 2 pack will give you the headlights and taillights for two bikes, and the lights themselves are so easy to remove, they pull double duty as flashlights. This little light is a compact and uncomplicated solution for your everyday bike excursions around town or during your longer trips in the dark. 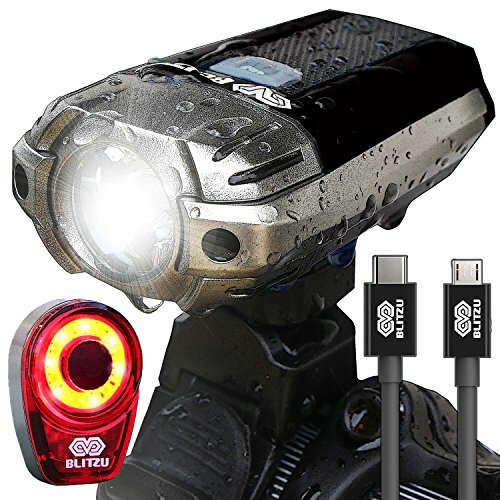 This bike headlight comes with a taillight and is removable for use as a flashlight or just to conveniently recharge with the provided USB cable. 4 light modes: high, medium, low, flash-daylight mode. This rechargeable headlight provides 300 feet of visibility with a 360-degree rotation so you can aim it just where you want and really utilize the heavy duty 300-lumen light. This headlight is easily detached to use as a flashlight and with the included taillight will combine to offer you 360 degrees of visibility. 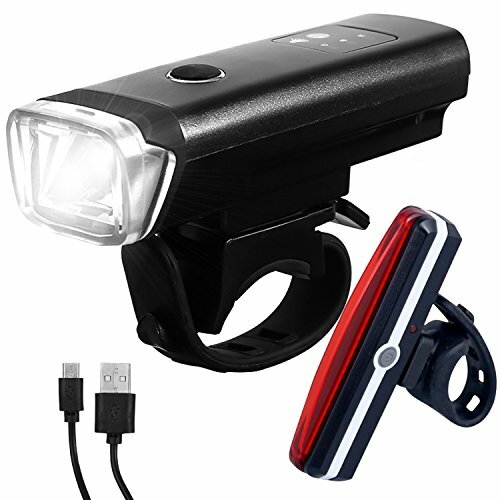 This waterproof dual-light headlight secures to your bike, offers 600 lumens, and recharges via an included USB cable. This 900-lumen light can be mounted with either the cylinder mount or the flat mount, or you can carry it with one of the included 2 straps, as well. This 1200-lumen bike headlight most closely resembles a retro bike light and will offer you an incredibly bright path while attached to your bike. This 1600-lumen bike headlight in a canister style was designed to keep you safe at night but is versatile enough for just about anything you could want to do with it. This 800-lumen light also includes a Daylight Running Light flash mode that will keep you safe even in sunny or inclement weather. This bike light offers 700 lumens and 164 feet of brightness without blinding oncoming traffic making it an excellent option for night commutes. This 1200-lumen light will light your way in the dead of night with no problem, and the taillight will make sure you’re seen by approaching traffic, too. This 2400-lumen headlight has an exterior rechargeable battery that offers a long lasting life between charges. This bike light has 4 light modes that range from 250 lumens to 1000 lumens, making this bike like an incredibly versatile one. Bropang -Hands-Free Bluetooth Bike Speaker with Bicycle Headlight. This 200-lumen bike headlight will connect to your Bluetooth device and play your music, read your book or answer a call while you take your bike to your destination. The only thing you’ll need to install this 110-decibel bike horn and bike headlight is a screwdriver, and the manufacturer has included it with your purchase. This 120-decibel, 250-lumen bike horn and light is an excellent choice when you need a light and can see the benefit to also having a horn as a source of emergency warning, as well.